100% Silk: Crepe de Chine, hand rolled Scarf - The "Cadillac" of Scarves. Both lightweight and holds a beautiful drape when worn. Hand dyed and painted with soy wax resist at my home studio in Arlington, MA. 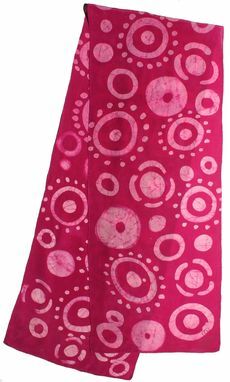 Shireen Scarves represent my inspiration as an Artist, Designer, & Yogini. Each scarf is made one at a time. There are unique differences in Color, Design & Layout. Any Scarf represented here can be Made-To-Order, into different colors. Silk can be worn year round. The more you wear it, the softer it gets, and takes on the energy of your Body, Mind & Spirit. 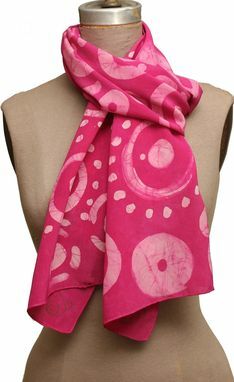 This scarf is inspired by my Textile Design background for creating patterns. I love drawing and find this medium of creating quite fulfilling in my self expression as a Fashion forward Yogini.